So, I pulled this card out awhile ago and almost wrote about it a dozen times. Now, Joe Buck’s monstrous head and Tim McCarver’s repeated idiocy have rendered it pointless. Yes, the decision was fated to benefit the Cardinals. As did Roy Halladay’s friendship with Chris Carpenter…or something like that. Still, I can quibble with the whole “Rookie of the Year” candidate thing right? I mean he was as much a candidate as Ron Paul is for president in 2012. Last I checked, the top NL rookies of the year were Buster Posey, Jason Heyward and Jaime Garcia. Heck, among NL rookies, Freese’s 0.5 WAR was behind those above and Starlin Castro, Neil Walker, Ike Davis, Jose Tabata and Jonny Venters and tied with Gaby Sanchez. 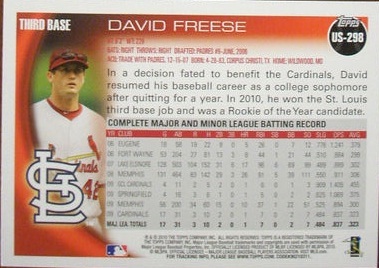 Freese had a fine 2010, but appeared in just 70 games. His .296/.361/.765 foretold of future success if he could stay healthy. Good for him that a whole heaping lot of that success happened in the grandest stage of them all.